I wielded a PSPGo again yesterday and, I must confess, only will power, professionalism, and the fear of the Pottery Barn rule kept me from tossing the machine in the air. If I did toss the PSPgo, I would not have tossed it in anger. I have nothing against the system, even though Sony does have two linked complications with the device the company still needs to address. No, if I tossed the PSPgo it would be out of delight, because this system is so disarmingly light. We've estimated that it weighs under 4 ounces. A new iPhone weighs just under 5. Yesterday, holding the Go in one hand and a new Apple phone in the other, I had trouble telling the difference (because I'm super-strong, of course). More importantly, the PSPgo has the weight of something I want to fling or fiddle with: like the three-inch-tall wooden Pac-Man ghost on my desk or my computer mouse or a normal deck of cards, which, Wikipedia informs me, weighs 3.3 ounces. Earlier PSPs weighed just under 10 and then seven ounces. The new Sony portable felt solidly made, even when flipped open, like it could take a toss or two or be something I'd start idly flipping up and down while talking to someone on the phone. DSis and other PSPs have too much heft to spark that kind of response from me. I guess we could contact a scientist to find out why, but I'm short on time today. 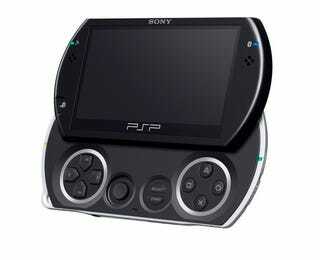 After my original PSP hands-on report from E3, readers asked if the system was too light. I'm not sure how a system could be too light, but I can say that the PSPgo, unlike the earlier PSPs is a machine that feels like you could forget it's in your pocket. The unit I played yesterday was loaded with several games. I played the new Jak and Daxter on it briefly, with no ergonomic difficulty. I also tried to use the Go's exclusive Game Sleep function, but the Jak build was blocking it. The Game Sleep function allows a player to sleep their game at any point and return to the cross media bar on the PSP to do other things — no saving required. I failed to ask if multiple games can be frozen with Game Sleep at the same time, but will follow up. For many of the vocal readers on this site, the questions that linger about the PSPgo are the price and the system's support of existing disc-based games, particularly those that prospective Go buyers already posess. The Sony rep I spoke to in New York stuck to the comments chief U.S. PlayStation marketing man Peter Dille gave Kotaku during E3, that the October 1, $250 unit is priced for early adopters. I kept two hands on the PSPgo yesterday. It's a solid little machine. The PSPgo just needs the plan around it to be clarified, to ensure gamers won't have other reasons to want to toss it other than its weight.